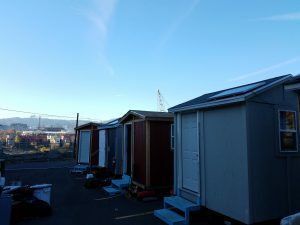 After relocating in June 2017, Right 2 Dream Too’s most compelling immediate need was 80 new, high-quality sleeping bags and ten solar-powered charging batteries to power the tiny homes where rest area operators live on site. In August 2017, Lloyd EcoDistrict reached out to eBay Portland about developing a local social service initiative with a technology angle. 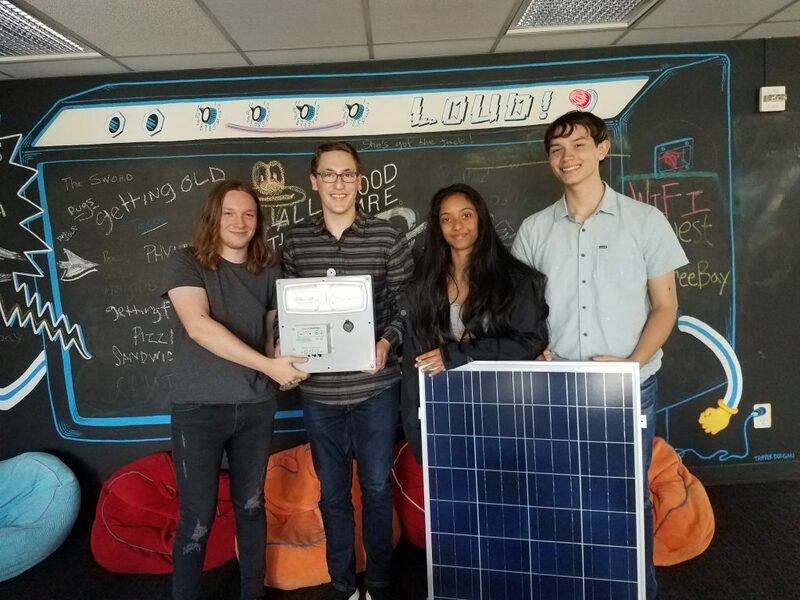 Juniors from Catlin Gabel School developed the solar-powered charging battery model, called a “JuiceBox.” Lloyd EcoDistrict saw an opportunity to partner with eBay Portland and Catlin Gabel School by creating the “Sleep and Recharge” campaign. Throughout the month of September, eBay employees helped raise over $11,000, $7000 more than their original fundraising goal! 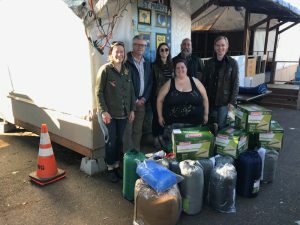 The campaign culminated in a work party at the ReBuilding Center, bringing together the students from Catlin Gabel, as well as a group of freshman from Benson Polytechnic High School, and eBay families. 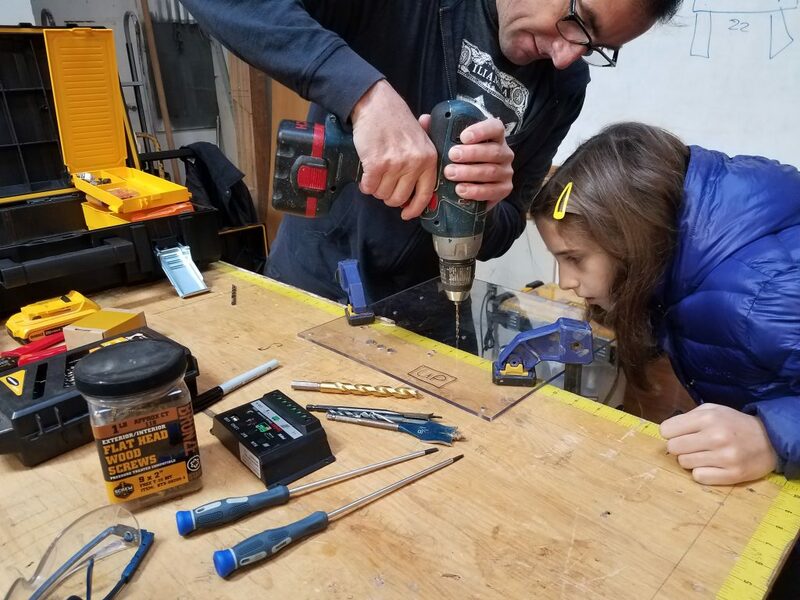 On Saturday, October 21st, 26 volunteers came together to build 11 solar-powered “Juiceboxes;” using reclaimed building materials donated from ReBuilding Center, students from Catlin lead the work party, instructing volunteers young and old. eBay employees brought their own young children, making the morning a collaborate effort that crossed family and age groups. 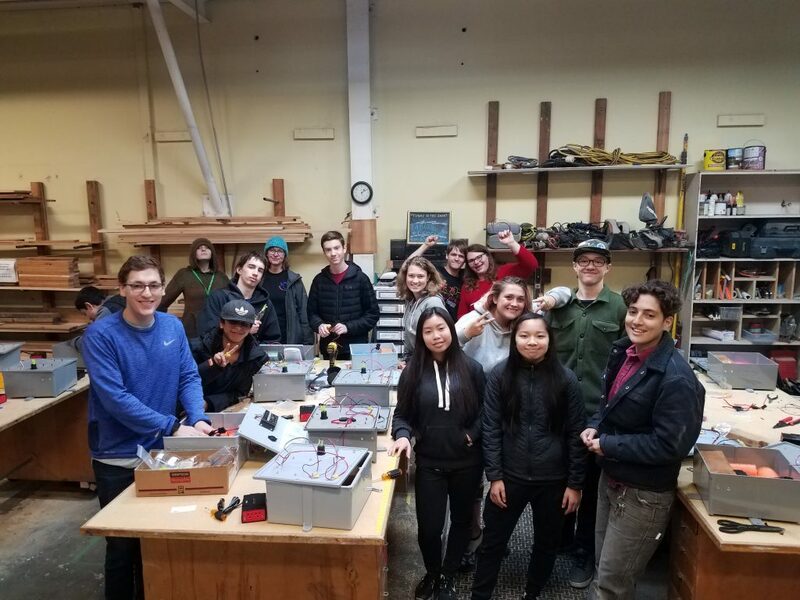 The freshmen from Benson received peer-to-peer tutoring as they wired the boxes, getting some hands on technical experience. All the volunteers were encouraged to write their names in the boxes, turning the battery into a personalized welcome card to the R2DToo members and a time capsule of their morning spent in service of this social mission. These Juiceboxes were developed by a group of juniors at Catlin Gabel. The batteries will allow for the R2DToo members that operate the rest area to light their homes and charge their devices, increasing their ability to find jobs, keep up with local news, and stay in touch with the community. The student team developed these batteries in order to bring power to houseless Portlanders. The Benson students have also been involved in helping Right 2 Dream Too get settled in Lloyd. Together with the volunteers from eBay, these student groups took several hours out of their Saturday morning to learn and work in order to improve the lives of people running and visiting the emergency rest area. Catlin Gabel School is an independent day school located in SW Portland. SHINE was founded by a group of junior year students and includes members of the robotics team and engineering program. For more information about the organization and the students’ work to bring resources to Portland’s shelters and rest areas, visit www.shinewithus.org. eBay Inc.’s mission is to be the world’s favorite destination for discovering great value and unique selection. Our vision for commerce is one that is enabled by people, powered by technology, and open to everyone. The Portland office has become home to the eBay for Charity program, which allows buyers and sellers to designate funds to any of 30,000 charities, allows nonprofits to sell directly on eBay, and raises about $75 million a year. ebay believes in creating more economic opportunity for all and is committed to finding ways to get involved in the communities where their employees work and live.